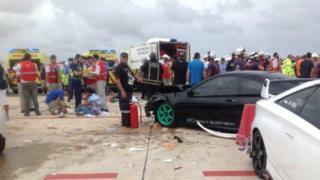 A car has lost control and crashed into spectators at a motor show in Malta injuring 26 people, officials say. Five people - including a young child and the driver of the Porsche - are in critical condition after the incident at the Paqpaqli event. Footage showed the car spinning out of control at high speed on the airport taxiway used for the event. There were scenes of panic, with some in the crowd shouting: "Oh, my God!" and "Ambulance!" "The car was speeding down the taxiway when a back wheel went on the grass. The car spun out of control, went through the barriers where a large crowd was watching, and into the area of the static car exhibition," an eyewitness told the Times of Malta. Some of the wounded were taken to hospital by helicopters. Event organisers said the incident would be investigated and the rest of the show was cancelled.